Ahead of the Smashin Brum book release this Friday at the Wagon and Horses in Digbeth we caught up with Rob Kay to talk about the reasons for putting Birmingham’s graffiti history in to print. First off, gotta start with the boring stuff. Can you give us a little background about yourself and your history within the Birmingham scene? I started painting in the late 90s. Started going into Birmingham to take photos of graff in the early 2000s, I used to see photos on the internet and wanted to take my own photos. When everything went digital I lost interest. I wanted hard copies, books and magazines. It wasn’t the same as looking at photos on a screen. I feel Brum scene has always been really under-represented within the UK. Was that part of your impetus to write the book? The idea to write the book originally came from Page FKS. When he first saw Crack & Shine by Freddy Forsyth, he wanted to put something together to represent Birmingham in a similar way. He came to me with a load of scraps of paper with names and ideas scribbled down. We chatted about it for a while but the idea eventually fizzled out. Every couple of months I’d get Crack & Shine down from the bookshelf and mull over writing something myself. Eventually after going through a few different ideas I decided to have a go at my own book. I’d already put a few of my own magazines and zines together and helped other people with doing the same, so I roughly knew how to kick it off. Interesting you mentioned Crack & Shine, I feel a lot of writers in both London and Birmingham share a similar aesthetic and ethos to bombing. Do you agree? London and Birmingham have had a long-lasting connection through the NHS (Nasty Habits) crew. Rate lived here in the 80s and Korsa spent a lot of time in London with the DDS (Diabolical Dubstars) crew and they made a fair few visits to Birmingham. The Crack & Shine style has been a massive influence on Birmingham writers and many of them have stuck with the style. Although with access to so many styles via the internet I feel like it’s becoming a watered-down version of the likes of Korsa, Crem and Reas. London has had many iconic tracksides whereas Birmingham has had the iconic canals. I guess we are trying to keep it similar but just working with what we have. There is definitely a mentality with a lot of people here that if its not chrome and black its not real graffiti. Birmingham has huge ups and downs. At the minute it’s at a peak. I’ve watched it go up and down for years. It’s had a lot of low points then out of nowhere it just booms again. In my opinion Selly Oak is looking the best it’s ever looked, or at least since I started going there in 2000. The standard of the pieces is really high, and the turnover is quick. It’s a shame to see some of the burners painted over so quickly but I guess thats what happens when the scene is at a prime so its not all bad, at least things are rotating instead of sitting stale. There’s not even time for tags in backgrounds. This was a massive problem in the early 2000s. 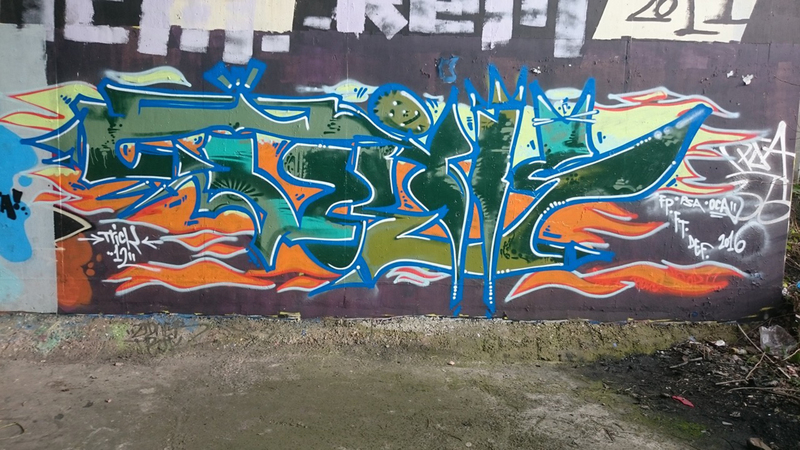 The illegal side of graff is also high at the minute. Not so much tags like years ago, but loads of tracks and roadsides. I don’t think the streets will ever be as bombed again as in the mid 2000’s east Birmingham and the bus’ were hammered back then. Theres a lot more to worry about on the streets these days such as cameras and mobile phones. I know there are a few people starting again due to it being more in the public eye. Before, it was something people grew out of as they get older, but now people are starting again due to having more time and money. style, bouncing ideas off one another, doing one another’s outlines. You mentioned about a lack of local styles. Do you think this is due to the emergence of social network sites like Instagram? What other affects do you think this has had on graffiti? Yes. People get to see so much more now. The only influences you had before the rise of social media was what you had around you unless you travelled. You could pick up on what city a writer was from by the style they painted. Social media has had a huge impact in graff overall. It’s made people lazy. It’s being used as a form of getting up rather than actually going out and getting up. Instead of going out and doing 100 pieces to get noticed you can do 10, put them on Instagram and get twice as many people see it, it’s taken away all the hard work, taken away the man hours walking tracks and streets, and staying out all night to get that perfect spot. How did you go about choosing who would be featured in the book? Choosing who to go in the book was a long and difficult decision. I knew I would upset people if they were left out, and I knew not everyone would agree with my decisions – but that’s life. If everything you did was to please someone else you would never get anywhere. It started off with a long list and I slowly whittled it down to 30 writers I thought had made in impact on the overall scene. Ones that have been consistent in the time they have been painting no matter how long or short that has been. It needed to be a few from the 80s, a few from the 90s, and a few from the early 2000s. I’ve seen so many writers come and go in and out of the scene over the years, so I didn’t want anyone that had started post 2010. That’s not enough time to judge whether they are going to stick at it, i didn’t want to put someone in that had gone hard for the last 5 years but then are going to be unheard of next year when the new wave comes along. In terms of not putting in anyone who started post 2010, are there any up and coming writers you think deserve an honorary mention? I didn’t want anyone post 2010 because it’s not that long to have been painting. I know certain people could have done a lot in that time but that doesn’t show any longevity. 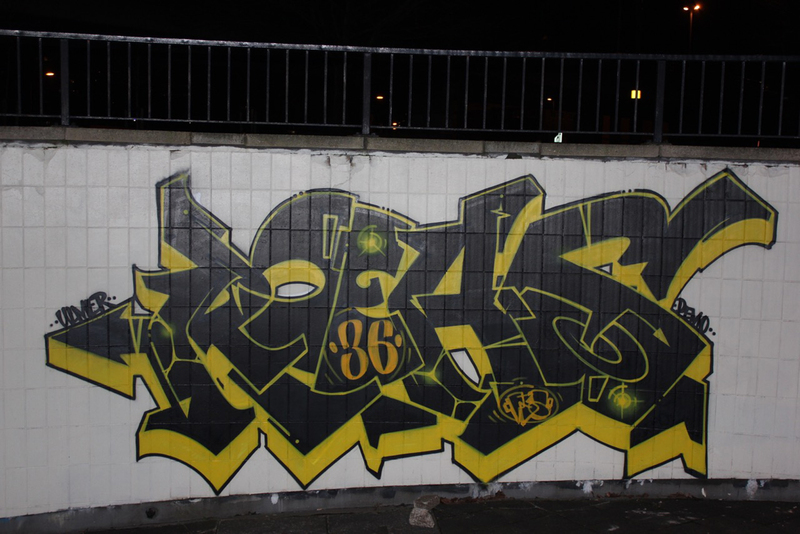 People have been doing graff in Brum for 35 years now. There’s a load of writers that I’d of liked to of put in, but like I said I wanted them all to of been painting for longer. Although this has been the bain of my life for the last 2 years I’m already considering a second one to get in all the newer writers that deserve to be in and the ones I missed that I wanted to get in. Maybe talk the ones that didn’t want to be in this one into being in the next one, there’s still a load of older writers I would of wanted in there. Only time will tell though. Are there any writers not in the book that you wish were? There are a handful of writers I wanted in there but for various reasons didn’t want to take part no matter how much I bothered, begged and pleaded. At the end of the day without it being as thick as a holy book, there’s only a certain amount of pages without it becoming so thick it wouldn’t be affordable anymore. There’s writers I couldn’t track down, some that just didn’t want to take part, some that I wanted but felt like they didn’t deserve pages. Some that went all the way through but pulled out last minute. Some that were just too difficult and became impossible to finish their sections. Writers are renowned for being illusive- 90% of these wouldn’t have done their homework in school, never mind write pages and pages years and years after they have left. Can you give us a little bit of background about the accompanying film and how that came about? The film was purely an afterthought. I started making a trailer to advertise the book but better and better footage kept coming out of the woodwork. Before I knew it I had 50 minutes of really good footage. Good enough to produce a DVD. When I got that far I said that if there was one person in there that didn’t want it to go public then it wouldn’t be released. I sat down with a few people and showed them what I had and one person said they were unsure- they didn’t want to give up the spots that were still active. So to honour their decision the film is being held back. This book and accompanying film could be seen as the legacy of Birmingham Graffiti. You’ve become the Henry Chalfant of the West Midlands. Are you proud of the work and is there anything you would have done differently? I wouldn’t go as far as to call myself Chalfont. Anyone could of done it. I just like to get things done, rather than talk about doing things. It’s too easy to let an idea fizzle out and fade away from leaving it to long to put it into action. I don’t know about doing anything differently. I think any difficulties I came across were out of my hands. If I ever came to a point where I couldn’t progress it was always because I was waiting for someone else to get back to me. I’m sure it would of been easier if I was still living in Birmingham. Thanks to everyone that helped along the way, everyone that pushed to keep it going when I thought I’d had enough, Thanks to Bab Mag for the chance to tell my side of the story.